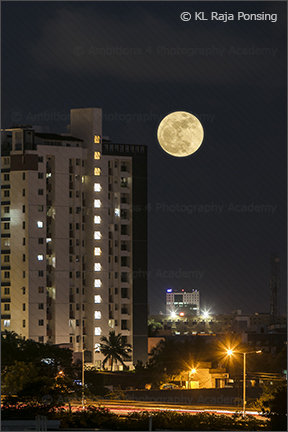 Though Moon reflects the light from the Sun, in the context of photography Moon is a light source. Though it is appearing in the night, the exposure for moon is not like as most of us think – a long exposure or ‘Bulb’ shutter. Surprisingly the exposure for a bright full moon is almost the same like any other Sunlight scene (1/250, f/11, ISO 100). Let us look into some of the tips to shoot a full moon. 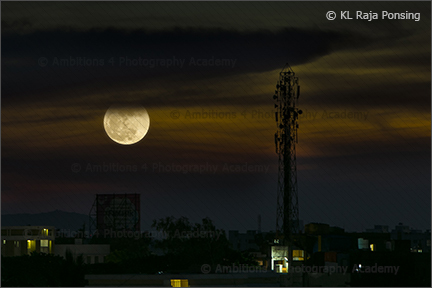 Try to shoot moon as it rises with a feel of sky and clouds. A small portion of the landscape included at the bottom of the frame, makes the image truly artistic. A late night shot will not give any details of the sky and the moon looks clueless with respect to the location we shoot. Moon, being a source of light by itself is very bright and a quick exposure (1/250, f/11, ISO 100) could being the details (the craters). The exposure given here is indicative only. We need to experiment to decide about the ideal exposure.Using a manual exposure mode is better to lock the desired exposure for all the shots. Remember that the edge of the moon has to appear sharp without too much of glow. Remove the U/V filter and see the front element of the lens is thoroughly clean. This will avoid unwanted flare or glare in the picture. A long lens in the range of 200-400mm may be best suitable. We can also get the advantage of greater magnification if we use a APS cropped sensor camera. To get the composition fixed and to avoid possible camera shake, a sturdy tripod is a must. Use mirror up option in the camera and release the shutter using a remote shutter release. Shooting with the 10 sec.self timer can be an alternative option. This will prevent the camera vibration. Try using manual focus or use a single point focus and match the focus sensor on to the moon and then shift the AF/MF switch to MF. Remember to disable the IS or VR as the camera is on the tripod. Include some tall structures or building that are lit well as a part of the frame so that the frame is gently filled. Moon partly hiding behind a patch cloud with a silver highlights will be an interesting shot.Remember the moon moves very fast, we need to be really smart to get the shot before it raises too high in the sky. Shooting in RAW would be an ideal choice, for in the post production we can bring in the details of the bright moon and relatively dark skyline with a bit of landscape.We can even shift the white balance as per our taste. Some feel a shift little to blue will bring mood. Some even feel to add little amber.